ALL IRONWORKERS ARE NOT CREATED EQUAL! 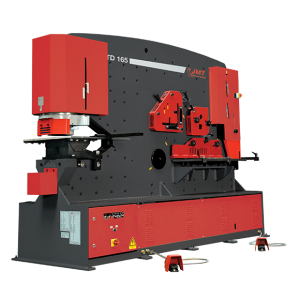 JMT’s IW series represents the epitome of precision ironworkers available today. Considering the computer-aided redesigned hydraulic system, the upgraded main twin hydraulic cylinders, and overload protection throughout the machine, the IW series has no equal. The newly designed outer structure provides a competent well laid out system that is both intelligent and easy to service. These ironworkers not only provide exceptional capabilities, they do it while taking up even less floor space. All the main structural components are created by the use of a fiber laser, contributing to the most accurate build quality available. All the main components are sourced by our build factory to meet JMT’s specific requirements for machine operating longevity as well as offering the customer the opportunity to source major components locally, when and if replacement parts are ever needed. The suppliers of our major components are considered to be the best available worldwide. Manufactures like, Bosch-Rexroth, Siemens, Schneider and Opkon. All of JMT’s IW series of ironworkers are C.E. certified for operational functionality, as well as C.E. certified for safety.